Crazy Rainbow Fly Fishing Guides provide exceptional choices for fly fishing on the Grey Reef with access to the North Platte River from Crazy Rainbow's private access points. Our professional guides can provide a fly fishing experience along the tail water of the Miracle Mile reservoir or go deeper into the Fremont Canyon with history regarding the explorer John C. Fremont. 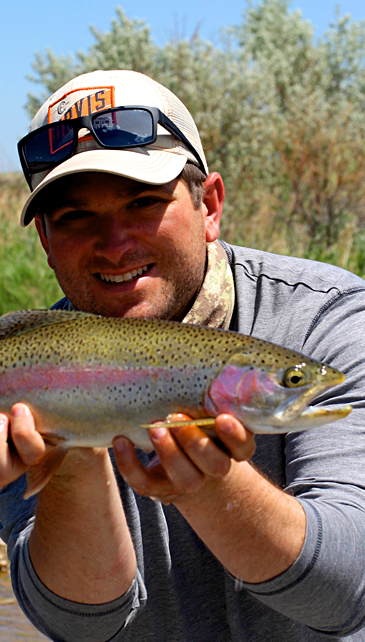 Crazy Rainbow guides the Big Horn River at the Wedding of the Waters. Test your fly fishing skills with an unforgettble Fly Fishing experience of a lifetime "Carp Fly Fishing". Pre-Purchase your fly fishing gear from the Ugly Bug Fly Shop for convenient shopping. We have some great discounts in effect and we'll SHIP orders of $50 or more for FREE, or choose the 'ship to store' option and your order will be waiting for you at 240 South Center Street, Casper, Wyoming for ease of convenience.